This morning, I awoke to good feelings and a need to go outside and enjoy some good warm weather (with sympathies to those in Texas, who are dealing with a terrible hurricane and storm right now). And so I did, to the Capitol Hill area of Seattle for a morning walk. There, a pleasant little flea market, known as the Cal Anderson Park Garage Sale. I saw many local looking people with tables, with their own stuff sprawled out for sale. I gazed over the nice variety of all one could ask for at a garage sale/flea market/swap meet or whatever you want to call it. For me, it was a glorious treasure hunt, with $40 dollars in my pocket to spend. Such fun, and probably the best outside flea market I have been to in a long time. One reason being, the sellers were friendly and represented the best of the local Cap Hill eccentric vibe, leading to a lot of fun and special items being sold. Another reason is nearly everything being super cheap, and reflected more of the garage sale mentality promoted in its title. See my phone pics below for more of my joys in flea market diving, with the last being a sampling of my treasures (I spent $34). My view of the latest solar eclipse of 2017, above. Living and working in Seattle, I witnessed a 92% peak of its possible totality. It was a privilege to have that much, being so close to its 100% totality across mid-Oregon state. Such was an awesome sight from glasses (well worth the trouble in procuring). The time of the moon passing over the sun a little over two hours, with its peak at 10:20 AM. Such was the lively experience, witnessing the awesome power of our tiny moon, blocking the overwhelming presence of our closest star, for just the moment. 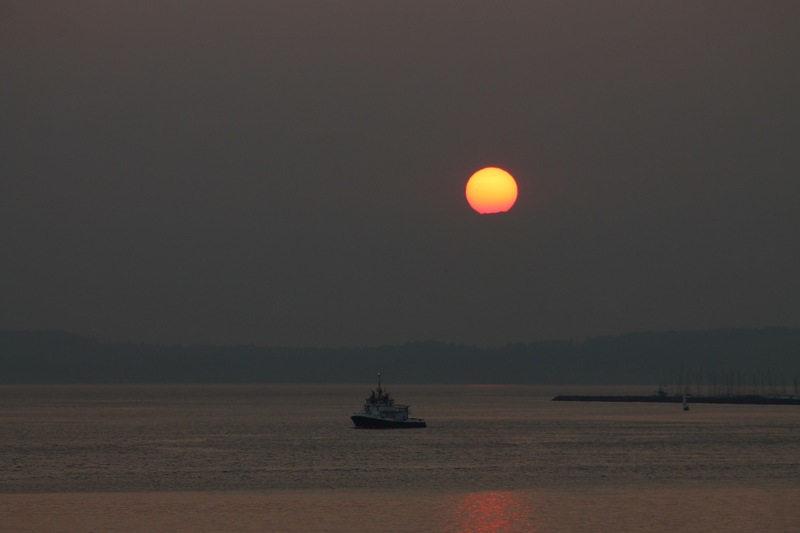 Just days ago, the air in the Pacific Northwest suffered through smoke from some wild fires in Canada. The air quality was bad, with the hazy skies covering the blue. Yet, the good part being the decline of the threatening heat have and awesome sunsets. I was not around for the height and worst of the air but managed to see this catch this moment last Friday. From the Seattle waterfront’s Olympic Park, I enjoyed this moment of this dim sun falling far beyond Elliot Bay. "Listen to me, Morty. I know that new situations can be intimidating. You lookin’ around and it’s all scary and different, but y’know … meeting them head-on, charging into ‘em like a bull — that’s how we grow as people." -Rick Sanchez, of the Rick and Morty show. Picture is taken by me, from outside the 2017 San Diego Comic Con, in a special area event hosted by Cartoon Network&apos;s Adult Swim cable programming. I love Rick and Morty, and ready for the new Season 3 episodes. A personal favorite shot above, showing my mood hours later after first arriving in San Diego two weeks ago. The location, the end branch of the long Municipal Pier in Ocean Beach. It&apos;s a lovely place, no matter the picture. Just enjoy it, in any mood. More shots to come, later and clearer.